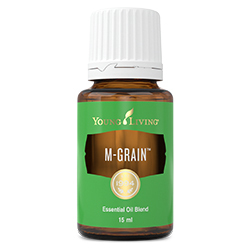 M-Grain™ is calming when applied topically, and has a cool touch when applied along the neck and shoulders. This invigorating blend is calming and clarifying, and can help clear negative emotions and encourage you to embrace new experiences. Dilute and apply to muscles, temples, feet, spine, or neck for a soothing sensation. M-Grain is an excellent addition to your collection, especially if you spend extended periods of time sitting down (at the computer, at your desk, in transit, etc.). Diffuse to promote a sense of wellbeing. Complementary essential oils include: PanAway, Clarity, and Peppermint. Basil (Ocimum basilicum) oil †, Marjoram (Origanum majorana) leaf oil †, Lavender (Lavandula angustifolia) oil †, Roman chamomile (Anthemis nobilis) flower oil †, Peppermint (Mentha piperita) oil †, Helichrysum (Helichrysum italicum) flower oil †.